Constant law changes are what goes with rugby's complexity - an unending attempt to ensure that the game's delicately-balanced machinery does not clog up, often producing unintended and unanticipated consequences. The last year has seen significant change, and vigorous debate over the worth and consequences of the Experimental Law Variations. Among possible ways in which legislators might alter a game, it is hard to imagine one more fundamental than changing the number of players. It has happened only once in the game's history, in its early infancy, only a few years after the Rugby Football Union was formed and a set of rules agreed. In fact, as Admiral Percy Royds pointed out in his history of the laws, there never was a formal statement that games should be played 20 a side. That was simply the number used, in the early years after the RFU was formed in 1871, for major matches like internationals and Oxford v Cambridge. Teams generally lined up with 14 forwards, two half-backs, two threequarters and two fullbacks. But as Arthur Guillemard wrote in the 1874 Football Annual - a book which covered both main football codes and still hankered after a reunification, only 11 years after the split - 'As many clubs would often find it difficult to muster so many, fifteen is the usual number round London and in county matches'. Higher numbers also demanded a larger playing area, at least 130 yards by 70 - again not an issue for big matches, which were played at The Oval, but more difficult for teams playing on more restricted pitches. But by the mid 1870s there was a sense that something was going wrong with games played under the larger numbers. Guillemard, not merely a commentator on the game but an international player and referee and leading official of the RFU, wrote that too many games had become shoving contests dominated by endless scrums 'formed most indifferently' which players joined by twos 'giving the impression of a caterpillar whose last meal had stuck halfway down'. He wrote that, 'Matters seemed about as bad as they could be, forwards wasted their strength on protracted shoving matches, and backs neglected dropping almost entirely, so that all round the true science of the game was, to a great extent, lost sight of'. It was the Scots, at this stage in their history innovators rather than the reflexive conservatives they would become for much of the twentieth century, who proposed that in future all matches would be played by 15-man teams. 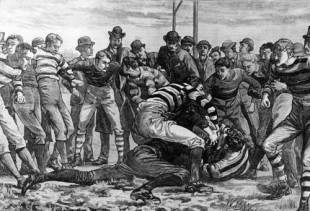 The RFU was disposed to accept, but said that the proposal had come too late for the start of the 1875-6 season and would have to wait for the following season. So it was that internationals that year continued to be played at 20-a-side. The Varsity match, which counted as one of the events of the season, was however played by teams 15 strong. The universities, with their large concentrations of young men, were the last clubs likely to have trouble raising a full team and the match was played at The Oval, so there was no want of space, but as Charles Marriott, later secretary of the RFU, recorded in the Cambridge chapter of Frank Marshall's Football : The Rugby Union Game, the key work on the game's early years, they had found 'how much more open and interesting the game became if played by 15 aside'. Oxford had tried to persuade Cambridge to play 15s a year earlier. It was played on the same day, December 13, 1875, as the 20-a-side match between Ireland and England in Dublin, the first international on Irish soil. This was bad news for Oxford who lost the previous year's captain, Arthur Michell, to England. They benefited, though, from that year's other significant innovation, the ruling that tries counted as scores in their own right and could decide a match if the teams scored no, or the same number of, goals, winning with a score from half-back J Forman. The Football Annual was not terribly impressed, recording a crowd of 800 for a match that 'failed to prove particularly interesting'. The trend, though, was unstoppable. From the start of 1876-7 all matches were played 15-a-side and, the 1877 Annual recorded 'after the satisfactory results attained, there is little chance of any alteration to this rule'. Arthur Budd describes it in Marshall as 'the dawn of modern scientific football'. Only Ireland remained unconvinced, suggesting - but not pressing the case - that their match against England in 1876-7 be played under the old dispensation. Jacques McCarthy, an acerbic and witty Irish critic, pointed out that the as-yet less sophisticated players of his nation had far more scope for chaos and disruption if there were ten more men on the field. The argument, if not that distinctive element in the Irish game, was lost and has not in more than 130 years recurred.